I don’t see a Golden Eagle often. Indeed the last time I saw one was a half-dozen years ago and it was flying at a high altitude somewhat south of the Lake. Today’s golden flew low along the north slope of the West Arm — a region with sparse observations of this upland species. 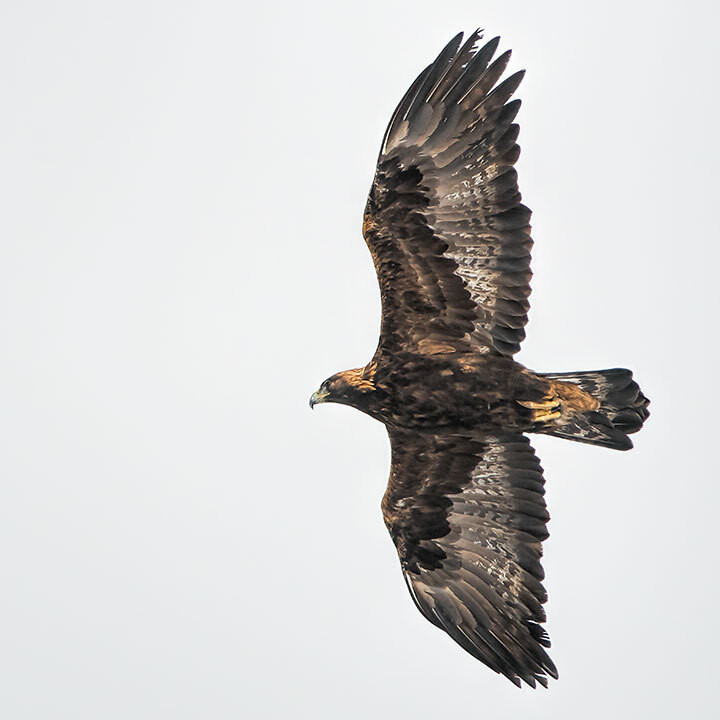 Mind you, Golden Eagles are reported more often than they have ever been seen. Usually the (erroneous) report is actually of a juvenile Bald Eagle, but I have seen breathless claims where the actual bird seen was a Red-tailed Hawk. Further, the Golden Eagle isn’t the gargantuan bird of popular myth. It actually averages slightly smaller than the Bald Eagle. Yet, seeing this upland bird is indeed a rare treat — especially a close observation, such as occurred on this occasion. A Golden Eagle flies low along the ridge north of the West Arm. One of the many features that distinguish this eagle as a golden is the colour of its nape. Woody, here we have Golden Eagles year round. But, they are never easy to find. They seem to be altitudinal migrants, hunting in the mountains through the warm months, but when most of their food is hiding beneath the deep winter snow, some goldens will hunt in the valleys. And that is when I saw this one.